"Feast for All Seasons" Turkey Sculpture / Salt and Pepper Shaker Holder | BUDK.com - Knives & Swords At The Lowest Prices! The "Feast for All Seasons" salt and pepper holder is a great conversation piece and a cool way to present these ubiquitous, all-important table condiments. It doesn't have to be Thanksgiving or even fall to appreciate the brilliant colors, lavish textures, striking realism and myriad other fine details present in this handsome 6" tall turkey sculpture. With tail feathers fully fanned, the gobbler in this kitschy-chic table centerpiece struts his stuff as he holds a shaker in each wing. He peers from between the shakers, his beard ablaze in vibrant scarlet red and head varying shades of cornflower, azure and powder blue. Molded from tough cold cast resin and painstakingly hand painted, this incredible piece has to be seen up close to truly appreciate all the subtle accents and meticulous attention to detail. There's just no better way to liven your tablescape and give those oft-unsightly salt and pepper shakers a much-needed face lift! 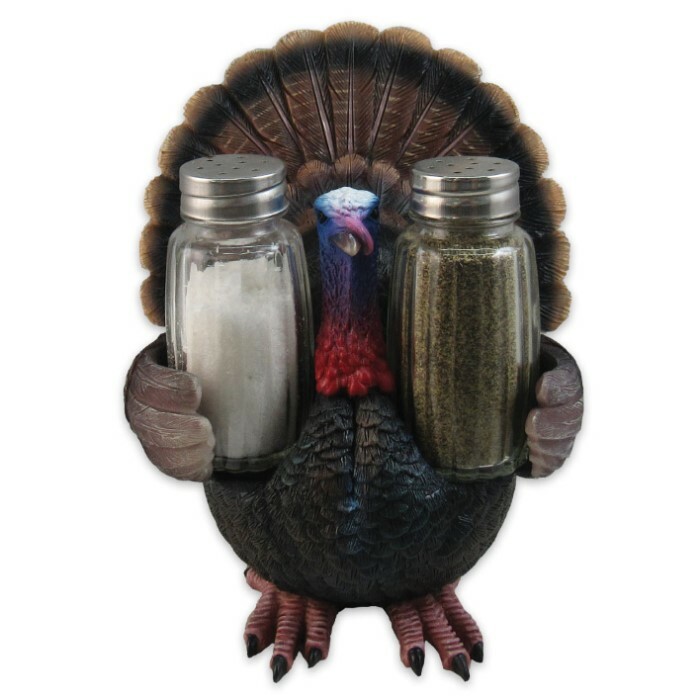 More than a mere novelty, however, the "Feast for All Seasons" salt and pepper shaker holder keeps your dining table organized and prevents salt and/or pepper spills. Truly a gem in "all seasons," keep this handsome bird on your table or countertop year-round for all your guests to admire! Better still, get two - one for your own table and one to gift to a friend or family member. It's an outstanding, unique gift that everyone will remember, and thankfully, it's easy with our unbeatable prices! Fits most average sized salt and/or pepper shakers.